The company has "reevaluated" a plan it just announced 10 days ago. 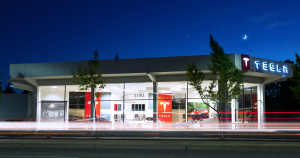 In late February, Tesla announced its intentions to shift to online-only sales via a blog post, which outlined a plan to close all but a small number of Tesla stores that would serve as “galleries, showcases and Tesla information centers.” Closing those stores would allow Tesla to cut the cost of its vehicles by an average 6 percent, it claimed, meaning it could finally sell the $35,000 Model 3 it had been promising for years. But just 10 days later, it seems the Elon Musk-led automaker has changed its mind about those plans — and no one is exactly sure why. On Sunday, Tesla published a new blog post announcing that, upon further evaluation, it has decided to “keep significantly more stores open than previously announced” — and because it will now close only about half as many stores, the cost savings on its cars will be cut in half, from 6 percent to just 3 percent. While the price of the $35,000 Model 3 won’t increase, the more expensive version of that model will cost more, as will all versions of the Model X and Model S.
According to Tesla, the lower prices are valid until March 18, giving interested buyers about a week to take advantage of the cheaper vehicles, but they will still need to make any purchases online — that part of Tesla’s plan hasn’t changed. No word on what Tesla found during the reevaluation of its physical locations that made it decide to keep so many Tesla stores open, and the company has yet to respond to our request for comment. Perhaps Tesla is now trying to find a way to keep current owners happy while drawing in new customers — though its approach leaves a lot to be desired, according to RBC Capital Markets analyst Joe Spak.